September 7, 2016 – New scenes from a frigid alien landscape are coming to light in recent radar images of Saturn’s largest moon, Titan, from NASA’s Cassini spacecraft. Cassini obtained the views during a close flyby of Titan on July 25, when the spacecraft came as close as 607 miles (976 kilometers) from the giant moon. The spacecraft’s radar instrument is able to penetrate the dense, global haze that surrounds Titan, to reveal fine details on the surface. One of the new views (along with a short video) shows long, linear dunes, thought to be comprised of grains derived from hydrocarbons that have settled out of Titan’s atmosphere. Cassini has shown that dunes of this sort encircle most of Titan’s equator. Scientists can use the dunes to learn about winds, the sands they’re composed of, and highs and lows in the landscape. “Dunes are dynamic features. They’re deflected by obstacles along the downwind path, often making beautiful, undulating patterns,” said Jani Radebaugh, a Cassini radar team associate at Brigham Young University in Provo, Utah. Another new image shows an area nicknamed the “Xanadu annex” earlier in the mission by members of the Cassini radar team. 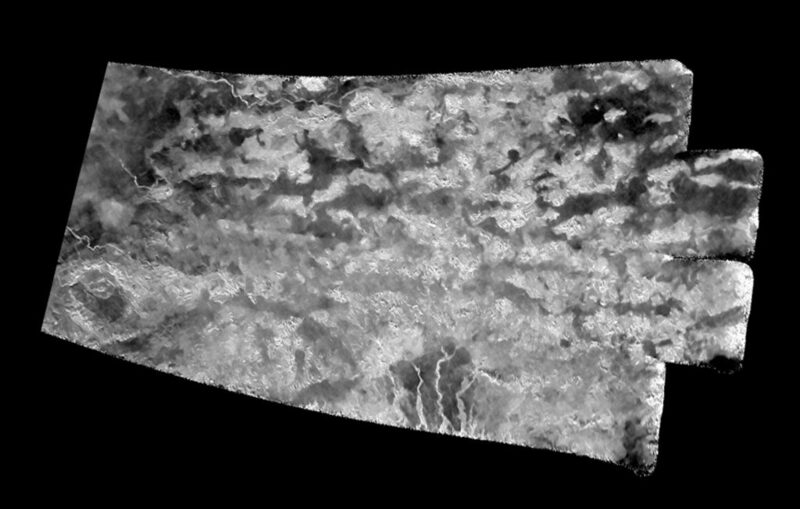 Cassini’s radar had not previously obtained images of this area, but earlier measurements by the spacecraft suggested the terrain might be quite similar to the large region on Titan named Xanadu. 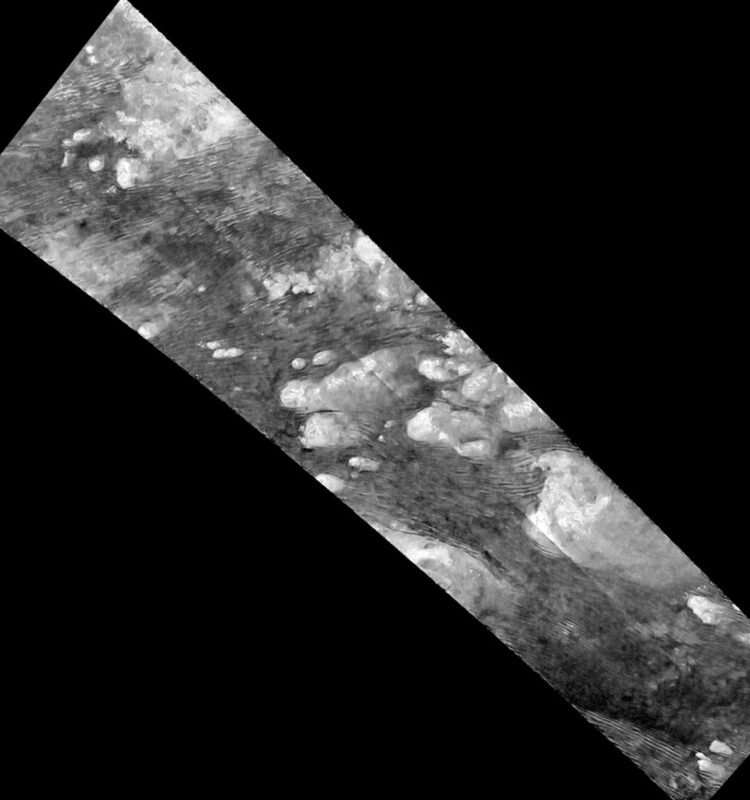 First imaged in 1994 by NASA’s Hubble Space Telescope, Xanadu was the first surface feature to be recognized on Titan. While Hubble was able to see Xanadu’s outline, the annex area went unnoticed. The new Cassini image reveals that the Xanadu annex is, indeed, made up of the same type of mountainous terrains observed in Xanadu and scattered across other parts of Titan. Xanadu — and now its annex — remains something of a mystery. Elsewhere on Titan, mountainous terrain appears in small, isolated patches, but Xanadu covers a large area, and scientists have proposed a variety of theories about its formation. The July 25 flyby was Cassini’s 122nd encounter with Titan since the spacecraft’s arrival in the Saturn system in mid-2004. It was also the last time Cassini’s radar will image terrain in the far southern latitudes of Titan. “If Cassini were orbiting Earth instead of Saturn, this would be like getting our last close view of Australia,” said Stephen Wall, deputy lead of the Cassini radar team at NASA’s Jet Propulsion Laboratory in Pasadena, California. Cassini’s four remaining Titan flybys will focus primarily on the liquid-filled lakes and seas in Titan’s far north. The mission will begin its finale in April 2017, with a series of 22 orbits that plunge between the planet and its icy rings. The Cassini-Huygens mission is a cooperative project of NASA, ESA (European Space Agency) and the Italian Space Agency. JPL, a division of Caltech in Pasadena, manages the mission for NASA’s Science Mission Directorate, Washington. JPL designed, developed and assembled the Cassini orbiter. The imaging operations center is based at the Space Science Institute in Boulder, Colorado. The radar instrument was built by JPL and the Italian Space Agency, working with team members from the U.S. and several European countries. The University of Colorado’s Laboratory for Atmospheric and Space Physics also contributed an instrument on Cassini.